The first review of the season from the Usher Hall, taking our seats in the gods for Britten’s Simple Symphony, MacMillan’s Piano Concerto No 3 and Holst’s The Planets. As always with classical concerts, the first half of this performance was supporting choices before the second half’s main event. Opening the evening was Britten’s Simple Symphony, a fitting choice for a season which covers the centenary of the composer’s birth. The Simple Symphony is scored entirely for strings, and the second movement is entirely pizzicato. The first, third and fourth movements were lovely, but it is this second movement that was the standout aspect of this work, demonstrating what can be achieved simply by combining many very quiet sounds together. It is a lovely example of mid-twentieth century creativity as the rules of music were discarded and should most definitely be heard live for best effect. The second supporting choice was the UK Premiere of MacMillan’s Piano Concerto No 3. I have to admit the words “UK Premiere” filled me with trepidation, and I was right to be cautious. This piano concerto certainly showed instrumental creativity, with the piano’s full range used to great effect. There was also a fabulous range of percussion included. However, the problem is one common to many contemporary works – there was too much going on and nothing was fully developed. None of the themes were allowed to become anything, and instead the music jumped from one idea to another with little sense of congruity. Perhaps this was the point – a statement on the fast pace and underdeveloped nature of modern living. I don’t know, because after a while the effect became all too much and it was hard not to drift off in my own world and stop listening. There’s something to be said for sonata form – following the process of theme, development and recapitulation do make music much easier to listen to and engage with. The second half was filled entirely with The Planets and what a treat it was. There’s nothing like hearing the swell of the orchestra as they reach the pinnacle of Mars to send a tingle down your spine! Often the movements are heard out of context. I enjoyed hearing the complete work in the order Holst prescribed as there is a surprising sense of continuity as well as contrast from one movement to the next. Neptune was the most surprising as the ladies of the RSNO chorus sang the ethereal closing melody of the work from behind the grand circle, walking away as they sang alone. The effect left the audience mentally floating out into deep space, and marvelling at the wonders of the universe. A marvellous performance by the orchestra and chorus, and a special note for the four gentlemen of the percussion section who were kept fit moving from one instrument to the next. 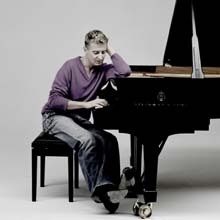 Jean-Yves Thibaudet played beautifully for MacMillan’s piano concerto, and kudos to his page turner – a job I do not envy! All of them were kept in line by the marvellous Peter Oundjian who gave a lovely introduction to the evening’s works between the Britten and MacMillan. A great start to what looks like a fantastic season. The programme was well-balanced and appealing to all ages. It was especially lovely to see a large number of children and families in the audience. I didn’t love the MacMillan, but I can appreciate the technical skill of the work. The Britten and Host works were wonderful. This entry was posted in Uncategorized and tagged 4 stars, concert, rsno, usher hall on 8th October 2013 by .